Mark 3 hundred years of the United Grand Lodge of England and English Freemasonry with this set of six stamps from the Isle of Man Post Office. Freemasonry is a 'system of morality, veiled in allegory and shown by signs'. 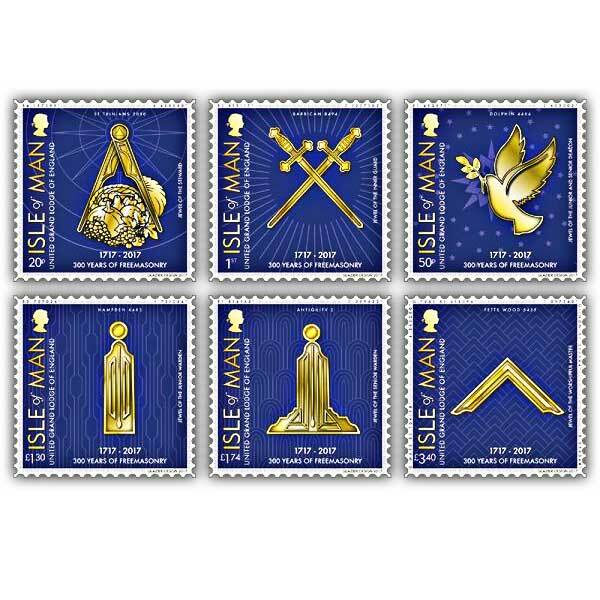 This formed the motivation for the stamps which feature the badges of office of the senior workplaces within the lodge, abstract architectural aspects from the lodges of England and the Isle of Man and discreet signs celebrating the tercentenary, as well as the 50th year of office of His Royal Highness The Duke of Kent, Grand Master of the United Grand Lodge of England (UGLE). Each stamp will feature a subtle ribbon with the characters HRHDOKGM50 in the border of the stamp and the main logo of the UGLE tercentenary which is only visible under ultra-violet light. The Queen's head and the lettering of the word Isle of Man are printed utilizing gold foil, while the main sign on each stamp is printed in colour to give the effect of gold. 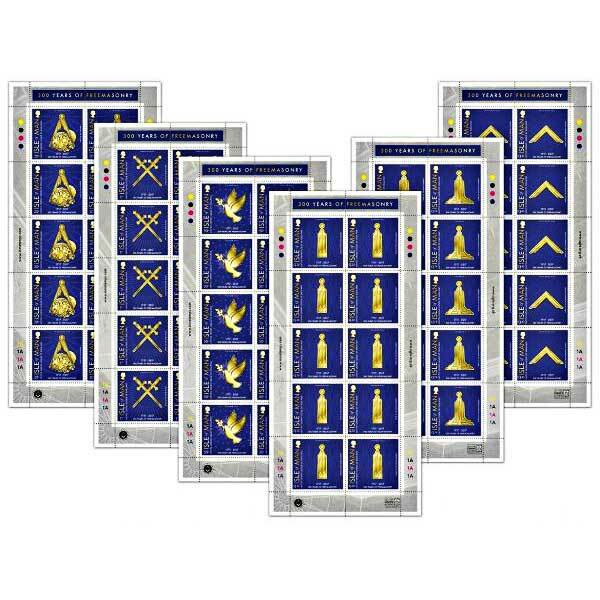 This set of 6 300 Years of Freemasonry stamps have been printed with gold foil highlighting HM Queen's head and the words 'Isle' and 'Man'. Each stamp includes a badge of workplace for senior officers within the lodge. There are extra discreet references to six essential areas at the top of the stamps and other covert mysteries, consisting of some visible only under UV light. The sheet sets contains six sheets, made up of ten of each design.